Carlton D'metrius Pearson was born in 1953. After high school, he attended Oral Roberts University where he received special attention and guidance from the founder, the late Oral Roberts (1918-2009). In the late 20th century, he became recognized as one of the most prominent black Pentecostal/Charismatic Christian leaders in the U.S. He pastored the Higher Dimensions Evangelistic Center in Tulsa, OK, a mega-church with a weekly attendance of over six thousand! It was an unusual congregation because it was interracial, while almost all conservative Christian churches in the U.S. were and remain either close to all white or to all black. Then one of his beliefs changed. He watched a TV program that would profoundly change both his life on Earth, and his understanding of the afterlife. The show dealt with the terrible experiences endured by people who suffered and died during the 1994 inter-tribal genocide in Rwanda. This caused him to consider his long-held belief that all non-Christians, after death, would be sent to Hell for horrendous abuse in its torture chamber -- without any hope of an end to the pain. This has been described as God's infinite punishment in response to humans' finite errors in belief. He felt that he had received an epiphany from God -- a sudden realization that his life-long beliefs about the afterlife were wrong. He found them incompatible with belief in a loving, omnibeneficient God. He rejected the idea that a loving God can send everyone -- babies, children and adults -- into Hell because they haven't heard about Jesus, Christianity or the Bible. He concluded that Hell did not exist as a place of eternal torment. Situations approaching those in Hell only existed on Earth -- as in the genocide in Rwanda. "... a new voice that is emerging in Pentecostal circles. The God [who] Bishop Pearson is serving is a God of love, not judgment; a God of universalism, not sectarianism; a God of expansion, not control. It is intriguing, provocative, and hopeful, a surprising twist in our ancient faith story." But as soon as he revealed this new belief to his congregation, members found it so unacceptable that they began to leave the church. Attendance dwindled to a few hundred weekly. 4 The church developed financial problems and closed. He later became the Senior Minister of Christ Universal Temple, a large New Thought congregation in Chicago, IL, then head of a new Higher Dimensions fellowship in Chicago; and an affiliate minister at Tulsa's All Souls Unitarian Church. According to the Unitarian Universalist Association's website describe, their faith group consists of "open-minded, open-hearted spiritual communities [that] help people lead lives of justice, love, learning and hope." His web site is titled: "Carlton Pearson, Progressive Spiritual Teacher, Thought Leader, Sacred Activist/Humanist, Peace Agent." The Bible's passages about what happens to individuals after they die. Some interpret this as saying that if one believes certain unspecified beliefs about Jesus, then they are saved and will attain Heaven for all eternity. Otherwise, they will lead a horrendous afterlife in the torture chambers of Hell forever, without hope of relief. However, others interpret the word "perish" literally and believe that the alternative to Heaven is annihilation and non-existence. Matthew 25:32-46: Jesus describes the final judgment where people of all races, religions, and countries after death are separated into two groups: "sheep and goats." The sorting is based on a single criterion: If they have helped needy people while on earth with food, drink, clothing, support in sickness and imprisonment, etc., then they are saved and are sent to Heaven. Otherwise, they are sent to Hell for all eternity. More details on the afterlife and salvation are available on this web site. 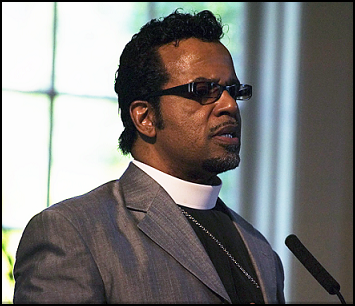 "Bishop Carlton Pearson delivering a sermon," image downloaded from Wikipedia.org on 2018-MAY-05. Created by Scott Griessel. CC by-SA 2.0. Carlton Preston, "The Gospel of Inclusion: Reaching Beyond Religious Fundamentalism to the True Love of God and Self," Atria Books (2009). Read reviews or order this book safely from Amazon.com online book store. Available in Kindle, Hardcover, Paperback, Audible, and Audio CD formats. Amazon.com reviewers have given the book a rating of 4.3 stars out of a maximum of 5. That is unusual for a controversial book on theology. Amazon's book review: "The Gospel of Inclusion explores the exclusionary doctrines in mainstream religion and concludes that according to the evidence of the Bible and irrefutable logic, they cannot be true. Bishop Pearson argues that the controlling dogmas of religion are the source of much of the world's ills and that we should turn our backs on proselytizing and holy wars and focus on the real good news: that we are all bound for glory, everybody is saved, and if we believe God loves all mankind, then we have no choice but to have the same attitude ourselves."